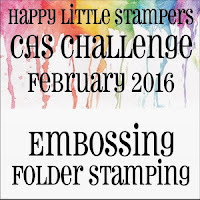 Hello everybody: I have a card to share with you today that I will link up to the CAS Colors and Sketches color challenge, the Addicted to Stamps and More CAS challenge and the Ruby's Rainbow Challenge Anything Goes challenge. Here's my card. The CAS color challenge calls for Melon Mambo, Pumpkin Pie and Pink Pirouette so I stamped the butterfly onto a panel of Canson water color paper with Melon Mambo and the specks from SU Gorgeous Grunge with Pumpkin Pie. I only had a bit of Pink Pirouette card stock so I punched the panel with the Modern Label Punch (retired) and then punched the Pink Pirouette with the same punch and placed it like a puzzle piece so it looks inlaid. I stamped the sentiment with Melon Mambo ink. I did a bit of high lights on the butterfly with my Pumpkin Pie marker and blended it with a damp, almost dry aqua painter. I didn't want the Melon Mambo lines to bleed. The sentiment is from SU Perfectly Penned (retired). Hello Everyone: Well, besides the loads of fun I've been having since I started this little blog of mine a little over a year ago and the fabulous, supportive, sweet, encouraging, patient and talented friends I've met along the way, I've been learning TONS of new stuff, from how to play with DSP, to new ways to color my stamped images, to how to upload a picture and write a blog post and now, I've learned how to STAMP WITH EMBOSSING FOLDERS!!!!! I've never heard of anything like this, I know you can ink up an embossing folder and then run it through the Big Shot to get a colored impression but this is totally different, so here is the card I made for the Happy Little Stampers challenge using this fantastic technique. I used THIS embossing folder by The Paper Studio and I inked the raised side with SU Rich Razzleberry, Tangerine Tango and Old Olive ink pads then I sprayed it with water, placed my panel of Canson water color paper and close the folder, then I just gently applied some pressure to help the ink along, the result was this fantastic background, I just love it!!! The Happy Little Stampers challenge page has some really great videos showing this technique, you can see one of them HERE , I guess any embossing folder would work but I've only tested this one, I'm going to do this technique with other folders to see which ones work best. My focal image is from the beautiful and sadly retired SU set called "Secret Garden", I stamped it onto Canson water color paper and colored it with the aqua painter and Rich Razzleberry marker, then I added some texture and high lights with Prismacolor pencils #995, #933 and white. The leaves are die cut with the Secret Garden die set and then I stamped the leaf of the Peaceful Petals stamp set to add the lines. The frame is from Spellbinders, the sentiment is from the same set, stamped in Rich Razzleberry and punched with the SU Postage Stamp punch (retired). See this "Enamel Dot"? I made it myself, there is a bunch of videos on Utube showing how to make them, HERE is just the one I watched. It's a bit time consuming but in the end, fun non the less. The sentiment is from the retired SU Whimsical Words stamp set, stamped in Rich Razzleberry, the flower is another image from the Secret Garden set. I hope my card is CAS enough for this challenge, I did follow the theme and I kept the embellishment to just that little purple dot. I hope you give this challenge a try, it's really fun doing this technique. Hello everyone: It's so cold and gray up here today that I wanted a bit of brightness and signs of Spring to cheer me up a bit so, I made this card, which I will share also at the CASolgy "GLITTER" challenge. Here's my card. The flower image is from a retired SU set called "Peaceful Petals" and it's heat embossed using Versamark ink and SU Tempting Turquoise embossing powder. The golden, glittery butterfly is cut using THIS die from Cherry Lynn. The sentiment belongs THIS stamp set by the Unity Stamp Co. I cut it in half because I didn't want to overwhelm the front panel and also, because I wanted to use the other part for the inside of my card, I heat embossed it in black, I wanted to make a little statement here. This corner punch is from EK Success and that is the other part of the sentiment. 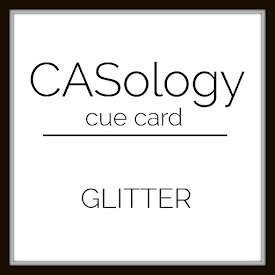 Here is the CASology CUE card that inspired mine. Hello everyone: I have another post to share with you today, this time is for Muse . Our Muse for this week is Michele Ferfuson and, we are asked to make a card inspired by her card but also guess what song inspired her card. To add icing on this challenge cake, our card should also be inspired by a song and if possible, get a Utube version of it. I truly hope I'm doing this right, I think we are suppose to provide the link to our song and we are suppose to guess our songs first on our reply to each other's cards without looking at the video. Goodness!! so far, I have no idea what songs inspired the other ladies and Michelle's cards, I have somewhat of a guess, I hope my guess is right. Anyway, here is my card, my inspiration song could be talking about ME!!! So, look at my card and think about what makes me tic. It might be a bit difficult for some of you who don't know me very well but, for those of you who do (and you know who you are, LOL!!) you probably be able to guess. I will give you a hint.....read the sentiment very carefully. I've used it before but this time it's all about me. Ok, on to this card.....the image is as old as I don't know what!!! All I can say about it is that I bought it a long time ago. It's unmounted red rubber, I just love this ballerina shoes, to me, the way this lady dancers dance is amazing. I stamped it on a panel of Canson water color paper with Stazon Jet Black ink and colored the shoes with the aqua painter and SU Regal Rose marker, I wanted to give them just a hint of pink. The ballerina's tights are done with Pearl shimmer paint, after all, I think the tights they wear are this color. Here is a close up that shows the shimmer better. I also stamped the pretty flourishes with SU Strawberry Slush and then, stamp them again with Versamark ink to heat emboss the image with some iridescent embossing powder. Michele's muse card had 4 die cuts with the word JOY so, I die cut four Musical Notes from My Favorite Things with gold foil paper. Ok now, here is the link for the SONG , try to guess it first. Hmm..I think Michele's song is I get Joy, Joy, Joy" by Carla and Redemtion? I hope you like my card and this song, after you listen to it, you will know why I picked it. Thank you so much for stopping by, until next time, happy dancing. Hello everyone: Today is a very special day for me. Since I created my blog back on December of 2014, I've been on a fun, wild, surprising, incredible and challenging ride, from the actual CREATION of the blog to participating in a lot of fabulous challenges and actually winning on some of them or getting Honorable Mentions from other ones. Today marks a new chapter in this Journey because I have the joy and the thrill to tell you I am now a new member of the Designer Team at the Retro Rubber Challenge Blog , which is a very special place for me since this was the very first challenge I participated in back on February 17th. of 2015, you can see the card I made for this challenge HERE . And now, here is my card as a new member of this fantastic Designer Team. This is an image from Penny Black from a set called HUGS , love this sweet hugging mice. I stamped the image onto a panel of Canson water color paper with Stazon Jet Black ink and then die cut it with Spellbinders Floral Decorative Ovals . The flower and it's center were stamped a second time onto a piece of Ninah Solar White card stock, colored and fussy cut to place on top of the already stamped image, I really like how they look three dimensional. The mice were colored with the aqua painter and SU markers in Chocolate Chip and Basic Gray, I added some shading with prismacolor pencils. Their little feet were colored with a bit of Pretty in Pink. You have probably have seen other cards I've made using the retired SU Pinking Hearts Corner Punch , this is the only image I could find, I just wanted you guys to see how this punch looks like, many of you probably never heard about it. I love this punch, I've not used it for punching corners, I just use it to punch out this perfectly shaped teeny, tiny hearts. It might look tedious to glue them but it really goes pretty quick and I just love the effect of a shower of little hearts. The DSP I used is from Lili of the Valley, I added a cluster of flowers to the corner using the retired Petite Petals stamp and punch, the greenery is from another old punch from "Punch a Bunch". The tag was cut with Spellbinders Tag dies and the sentiment was stamped with Strawberry Slush. The little ribbon is from my stash. The frame was stamped with the retired SU Four Frames stamp set, the sentiment is from a retired Flourishes set called "Tokens of my Affection" and the image on the corner was stamped with the retired SU set called "Valentine Defined"
I hope you like my very first card made as a Designer Team member for this awesome challenge blog. I also hope you participate and give this challenge a try. Thank you so much for stopping by, please visit again. Until next time, happy stamping. Hello Everyone: It's time for me to make another one layer card, I really enjoy this one because I'm going to link it up to the One Layer Simplicity Challenge , the AAA Cards "Love Me Like You Do" challenge, the STAMPlorations "CASEplorations" challenge, were we are asked to CASE Anita , the Share the Joy at Taylored Expressions, which is asking us to tell to whom this card is going so, I will tell you that it's going all the way to Lake of the Ozarks, MO. for a dear Triathlon friend and incredible supporter through out my humble career as a Triathlete, and the Uniko "Anything Goes" with an option of "LOVE". I've never tried participating in so many challenges with one card but I found this blogs through friends who've commented on mine so I thought why not give this a try. I love all of this leaps of faith I'm taking, such fun. Here is my card. This is a one layer card made out of a 10 1/2" x 4 7/8" panel of Canson water color paper scored at 5 1/4". I stamped the image with Stazon Jet Black ink and colored with the aqua painter and SU markers in Tempting Turquoise, More Mustard, Chocolate Chip, Regal Rose, Pretty in Pink, Old Olive and Soft Suede. 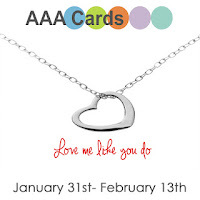 The sentiment and the hearts (from a retired SU set called Baby Bundle are stamped with Regal Rose ink. Those of you who know me know that I love the House Mouse little mice. This adorable and endearing image is called Sweet Kiss, I just love the sweet expression on the face of this true friends. I want to thank you so much for stopping by, until next time, happy stamping. 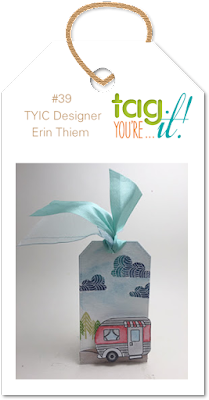 Hello everyone: This week at Tag You're It! challenge the inspiration was a tag made by Erin for the challenge, here is my take on it. This little tag was made with THIS die and stamp set I got at Hobby Lobby a long time ago. I did a bit of tweaking on it and stamped it several times to fussy cut the windows and door and the roof with it's chimney too. I really like this set, all of the images are really cute. I added a few little birds flying by hand. It was a little tricky to take this pictures, the tag didn't want to stay open and standing, I actually had to undo the ribbon to take a picture of the inside and lean this panel against the front panel and quickly take the photo. This is the tag that inspired mine. Hello everyone: This week the new challenge at "Less is More" is "DOWN UNDER". I must confess I was a bit stumped at first but then I got it!!! Their guest designer is Kylie and she is from Australia so, in her honor, this is the theme. So I thought and I thought and then it came to me, how about going a bit outside the box and make a card like this one? Ok, so this card has nothing to do with beautiful Australia, right? My idea on this card is feeling "UNDER THE WEATHER" and, trying to keep with the theme, I did used the colors of Australia's sports teams, (got the idea from Hannelie from Dessert Diva , thanks Hannelie). This image is from House Mouse Designs and it's called "Mouse Drops". I stamped it onto a panel of Canson water color paper with Stazon Jet Black ink and colored it with the aqua painter and SU markers in Bashful Blue, Not Quite Navy, Garden Green, More Mustard, Chocolate Chip and Basic Gray. The sentiment is from SU Teeny Tiny Wishes. Gosh, you can tell that this little mouse is totally feeling Under the Weather, so badly that he is willingly taking a drop of that green medicine, I do hope it tastes like limeade. The sentiment is from a retired SU set called "Curly Cute", I love the font on all 4 images. Thank you for stopping by, I hope you go take a look at the "Less is More" blog and give this fun challenge a try, this theme can be really interpreted in a lot of ways.